The CT87V and CT87E series has been discontinued. Please see the CTXL series as a possible alternative or contact our Data Acquisition Engineering department. 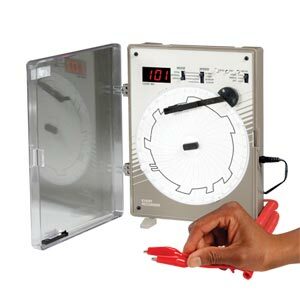 The CT87V is a precision instrument used to monitor and record voltage or current on a 152 mm (6") circular paper chart. A 3-digit LED displays the voltage or current value (i.e. no engineering units). CT87V ranges include: 0 to 5.00 V, 0 to 100 mV , 0 to 20.0 mA, or 4 to 20.0 mA. The CT87E is a highly versatile instrument, accurately records voltage, light or sound events. LED display can read length of event, time between events or total number of events. Battery backup assures normal operation during power interruptions. The unit can also be run from any 12 Vdc source (auto or marine). 참고: Each unit supplied with 8 AA alkaline batteries, ac adaptor, 2 pens, 60 assorted charts, and operator’s manual. CT87E also includes 3 sensors (volt, light, and sound).